In the first half of this comic, we meet Tyrannus. 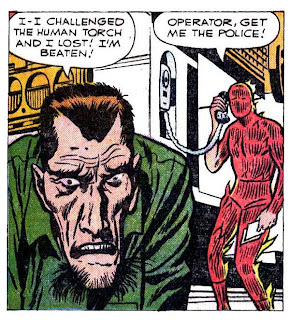 And although he's not a terrible villain, there are signs that he's not been thought through terribly well. Though dressed in garments evoking Roman imagery, he claims that he "was a brilliant master of black magic a thousand years before", and was "banished to the center of Earth centuries ago by the accursed Merlin the Magician" - kept alive only by the the underground Fountain of Youth, which had been sought (but never found) by Ponce de Leon. And yet, despite all this talk of magic and enchantments, not a lick of mystical prowess is seen. 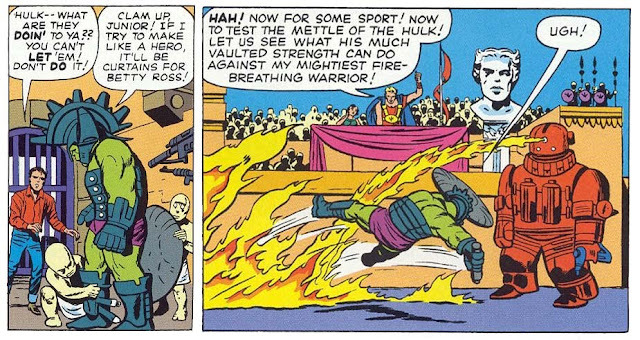 Instead, all of Tyrannus's devices are mechanical in nature, from the digging vehicle with which he captures Betty Ross, to the robot he pits against the Hulk in his gladiatorial arena. Fighting robots in a faux-Roman arena? The term for this might be "concept drift". That's not all that's off. See if this sounds familiar: We have a villain who lives under the Earth in a series of caverns and catacombs. His feelings of megalomania have only been encouraged by the race of bizarre, pale-skinned creatures who embraced him as their leader. 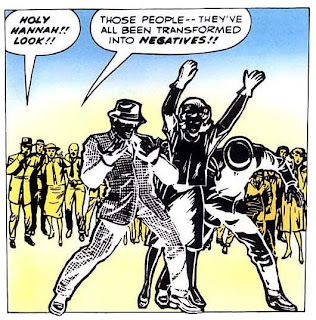 Sure enough - it's the Mole Man from Fantastic Four #1! Or near enough, anyway, to make you wonder how Stan could have possibly written what's essentially the same story just over a year apart. Between this and the retread of FF #2 just a few months ago, we could be forgiven for wondering if Stan & co. were just getting lazy and intentionally reusing the same plots. I suspect it's more likely this is just another sign of how unplanned the Marvel Universe really was; rather than carefully plotting out a considered course for their line of books, Stan was just winging it the entire time and writing at a breakneck pace. Which, given how many books he was helming at the time, is certainly understandable! And, frankly, a testament to his ability that as few clunkers slipped in as did. Y'know what should have been her first clue?That his name was Mr. Tyrannus! 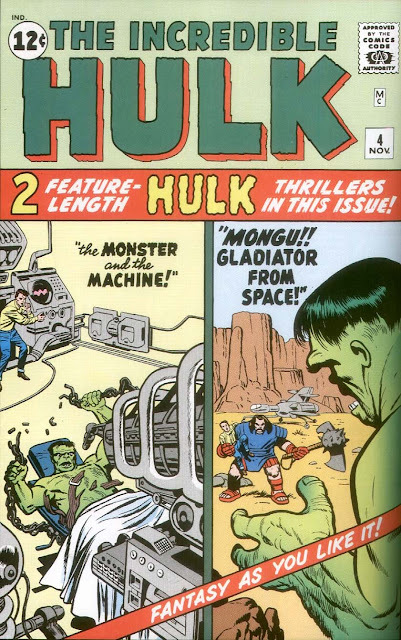 Last issue Banner rigged up a machine in his secret hideout that would let him transform from human to the Hulk at will, diminishing the power of the monster theme and effectively giving him a glorified superhero suit he can jump into at a whim. Here we see the other reason it's a bad idea: By blurring the lines between man and monster so much, the Hulk's motivations become so fuzzy and ill-defined it hardly seems the Hulk at all. For instance, in the second tale in the issue, the Asian principality of Llhasa sends a plea to the US to give them aid against the fearsome General Fang. 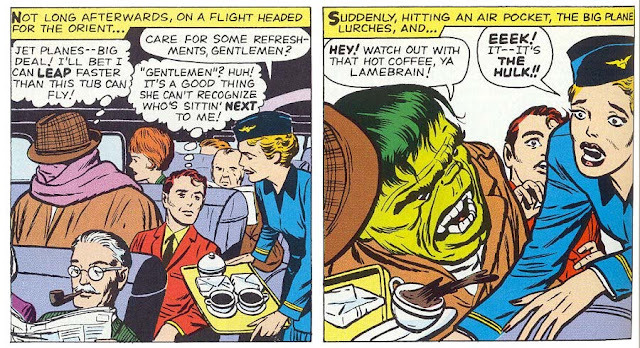 Overhearing the bulletin on his radio, Banner turns himself into the Hulk, disguises himself under a coat, hat, and scarf, and boards a jetplane! 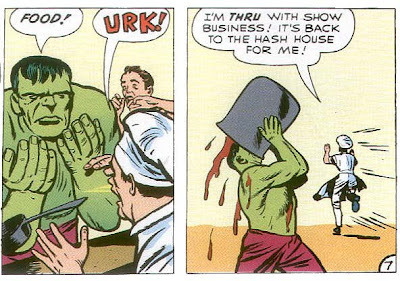 Does this sound like something you'd expect the Hulk to do? 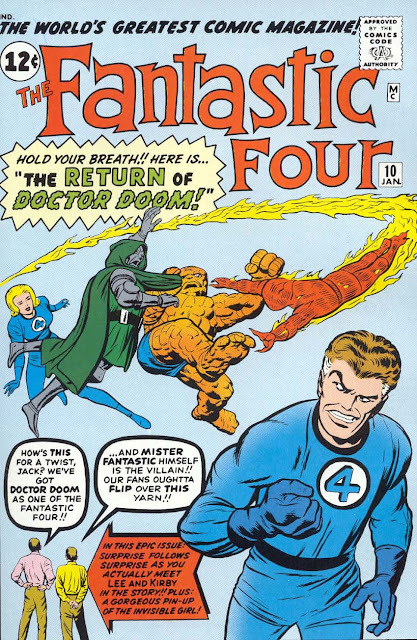 Or, instead, the Fantastic Four? With one ill-advised decision, Stan has turned the Hulk from a misunderstood monster into a not-very-reluctant adventurer. You know why Hulk no longer flies coach?This! This is why! Right here! Ah, yes. The story of General Fang. Even ignoring the ridiculous airflight hiccup, it's a very strange tale indeed. 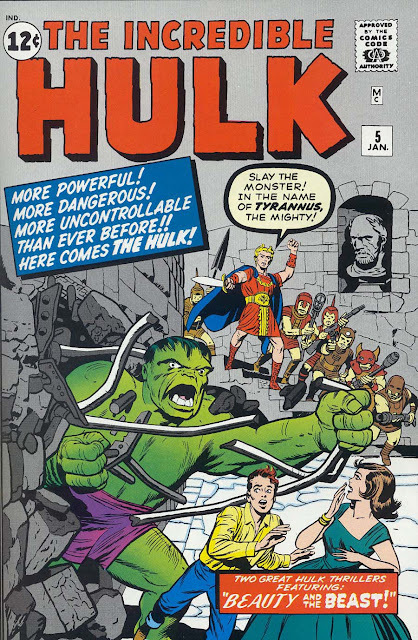 After Banner hears the radio bulletin and turns himself into the Emerald Goliath with the push of a button, the first thing we see the terrifying Hulk do is ... step over to Banner's library and grab a book entitled STRANGE MYTHS AND LEGENDS. Once they arrive, the Hulk dons a furry white costume he'd packed, because apparently the only thing sure to frighten General Fang and his communist armies is ... the Abominable Snowman. And while Fang fails to stop the Hulk with a holographic projection of a red dragon, his armies attack with tanks, missiles, an uncountable mass of horseback riders, and paratroopers. And if you think one of those sounds oddly anachronistic, you'd be right. The Hulk as The Snowman. Try explaining that on your official report! Once again, one of the most compelling things about this portrayal Loki is the creators' collective attempt to sell him as a convincingly mythic character, and not just another super-baddie. When Loki spies on Thor from Asgard, he burns some strange leaves and sap from a sacred tree; to sneak past Heimdall on the bridge, he turns into a small, thin snake; and in battle against Thor he turns a tree into a tiger and himself into a pigeon. 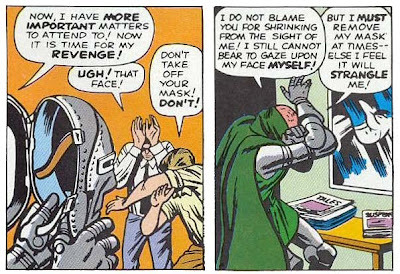 What this makes us realize with alarm is just how poorly Loki has been written ever since - as someone largely interchangeable with any other random supervillain. Bizarrely, Thor saved the negative people by causing his hammer to emit a stream of anti-matter. 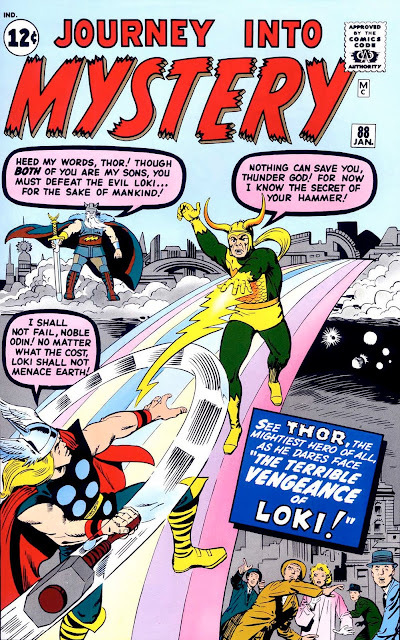 In a neat coincidence, Loki's first appearance and his return here both give Jack Kirby an opportunity to experiment with the form a bit. 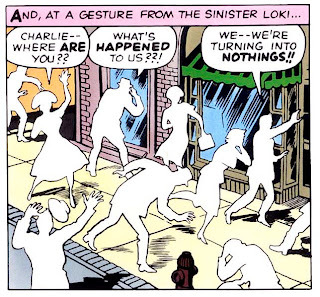 In this instance, Loki transforms various cityfolk into blanks, while the first time around he turned passersby into negatives. Either of these are a far cry from Jack's later forays into trippy photo collage, but already he's showing an interest in, and willingness to experiment with, the very form itself. Candy Town, USA. What a tasty place to live! 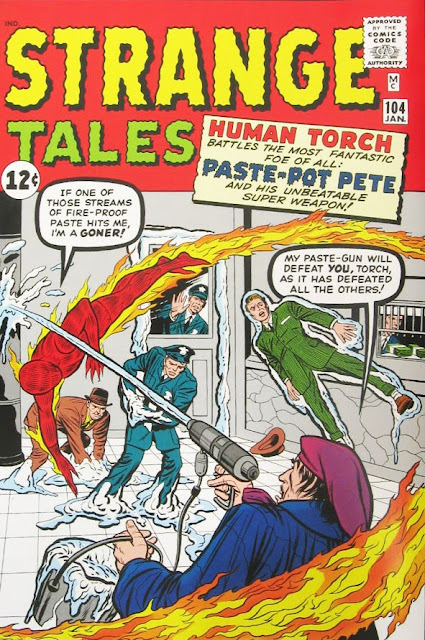 In this issue, the Human Torch faces off for the first time against Paste-Pot Pete. And it's a hoot - because the guy's name is Paste-Pot Pete! Before too long, Pete would take to call himself the Trapster and give himself a makeover - for one thing, smartly putting the reserves for his glue gun into tanks strapped to his back, rather than carrying an actual paste-pot as here - and has been updated even more in recent days, becoming a bit of a badass. But I can't help preferring this original form! And for those who might be rightly wondering "Why paste? ", I think we we can put Pete in the category of characters so created because of certain tasks that their creators were frequently engaged in. Also in this category: The Living Eraser. Bad at Secret ID: Exhibit A. 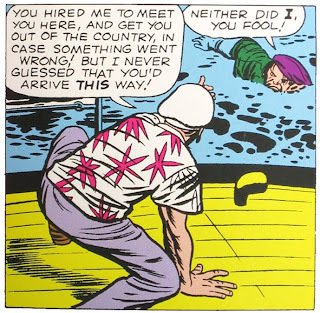 One would expect that in these early days of Marvel, without much planning or foresight, there'd be numerous slips and inconsistencies. Truth be told, there haven't been as many as you'd expect. But one area that's beginning to get out of control is the Torch's powers, and what he can do with them. 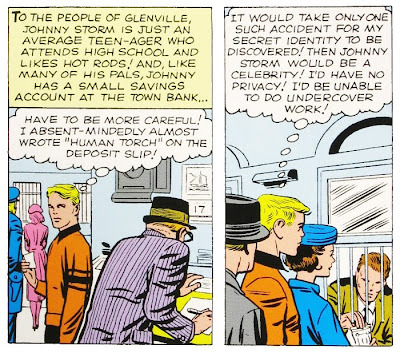 In the last couple of issues, Johnny has been very concerned about his flame's time limit, and it does always seems to cut out at an inconvenient time. Less credible is when the Torch, in a dangerous situation, has his extinguished flame relit by a powerful source of heat - as if his body were a smouldering pile of sticks which just needed to be stoked. But then it goes completely overboard. We've already seen the Torch construct flaming doubles of himself to throw off villains or a curious crowd of onlookers. And fine, we'll accept that. Maybe. But then he sends that double on a cross-country chase, following the villain down several twists and turns, like a homing beacon ... and that's finally more than we can take. This instantly became one of my favorite comic book panels of all time. 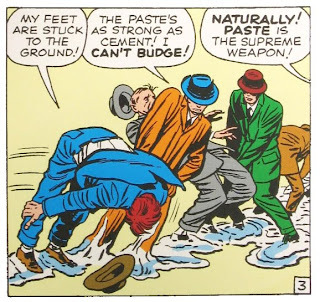 "PASTE is the supreme weapon!" Indeed. Paste-Pot Pete, all washed up - until next time. Good gravy, but this is a fun comic! See, when Larry Lieber's not on his game, the results are eye-rolling. But when he throws off all sense of restraint or good sense? The results are so ridiculously over-the-top that they're just a blast! Case in point: The Scarlet Beetle. When a regular beetle was mutated by one of mankind's atomic experiments (as if you hadn't guessed), it gains extraordinary intelligence - and thus rallies all the other denizens of the insect world, apart from the ants, to topple humanity in a series of coordinated attacks. This includes termites bringing down telephone poles, bees attacking policemen, and numerous public officials being suddenly bedridden from spider bites. Once again, Jack Kirby uses Ant-Man's tiny size to show us entire worlds we've never visited, simply due to a change in perspective. When the beetles first knock out Hank Pym and throw him down a hole, he tries to climb out - in vain - and it really does seem as if he's been trapped in some insurmountable underground cavern. Later, an outdoor park is the staging ground of a battle between an army of ants and the other massed insects, with a drinking fountain being the towering pinnacle on which both sides converge. And the scene of final confrontation for these tiny combatants? A wondrous toy store, of course! Happily, for what seems like the first time Ant-Man gets a fight that's fantastically inventive without abusing (too badly) the bounds of either science or plausibility. At the park, honey ants have created a sticky boundary to delay the oncoming horde, right before Pym leverages the spray of the fountain to repel the attacking grasshoppers. In the toy shop, he avoids the Scarlet Beetle's sudden strike by speeding away in a toy car, before winning the day by hurling the lance from a miniature knight and then capturing the beetle in a rubber balloon. 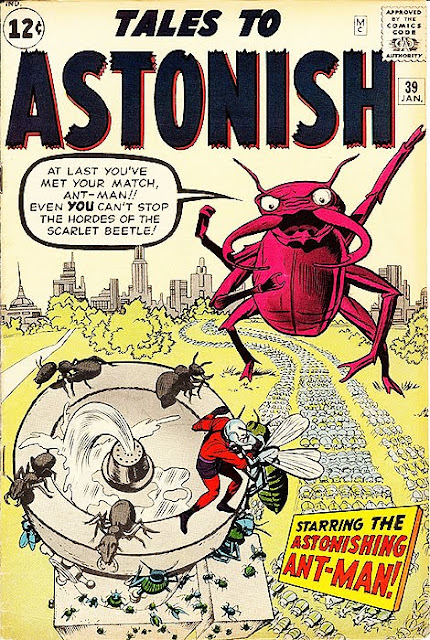 By the end of the story, Hank Pym has cured the beetle by counteracting its radiation, set it free, and gone on to his next case ... all in just 10 pages. 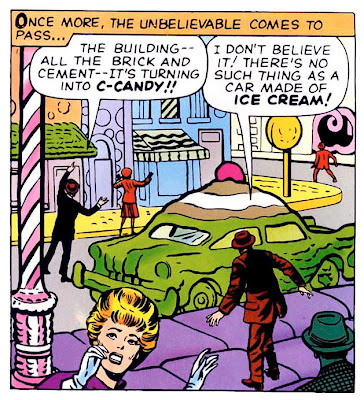 If only every Ant-Man story could meet this extraordinary level of goofy, crazy charm - what a comic that would be! 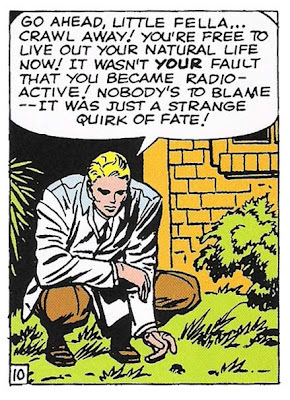 Hank Pym, friend to the little creatures. Even those that wage war on mankind. Back to Thor! And back to hilarious covers. (Oh, what am I saying? We've never left!) 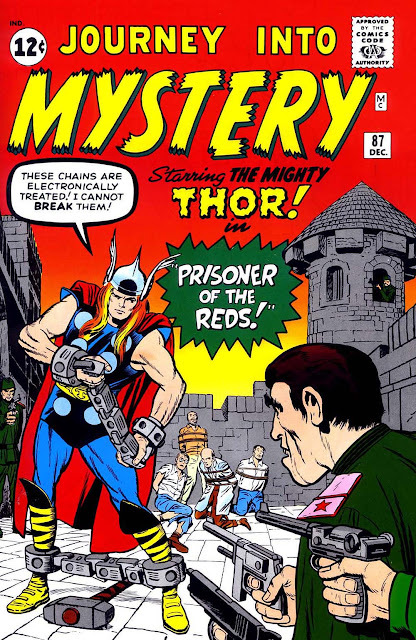 Because this time, he's "Prisoner of the Reds!" 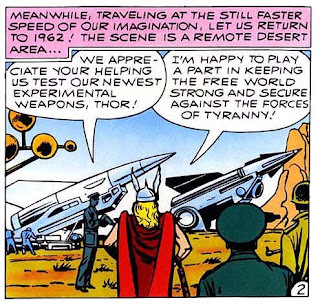 Joking aside, it's actually refreshing to see someone as powerful and grandiose as Thor pitted against such unarguably earthbound foes, as before when he faced the dictator of San Diablo. Partly this is fascinating because the vast difference in power levels is so unexpected; partly because it's unusual to see superheroes face off against any realistic enemies (even ones using outlandish methods); and partly because when we finally get around to exploring Thor's heavenly home, with its gods and trolls and elves and frost giants, the comic will quickly and irrevocably transform into a largely fantasy-based setting. Which is fine, and will certainly give the title a striking contrast to all the other comics on the stand - but makes early stories such as this one far more interesting than they otherwise might have been. 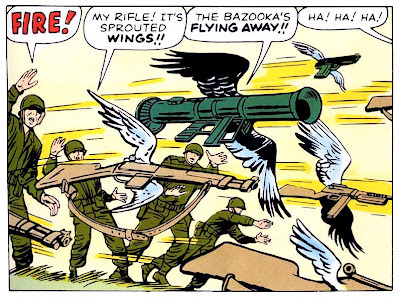 Something that has been pointed out whenever I've noted the alarming preponderance of atomic/nuclear bombs and mushroom clouds in these early Marvel comics is that they accurately reflected the fears and paranoia of the time. As quaint as it might seem now, the fear of imminent attack by a global superpower, either overtly or through insidious invasion, was clearly on the public's mind. Remember that this was only two decades after a certain European country threw the entire international arena into utter chaos in a war that caused countless deaths; and realize too that, without the broadened awareness we have today from globalization and instantaneous worldwide communication, such xenophobic fears of threats from without could find no rational evidence to argue against them. So this sense of a world ready to fall under attack at any moment, due to events outside the ken of the common man, must have been palpable - but was clearly also the seed for any number of nervous-making yarns. Don't you kind of wish more stories began this way? Okay, this one's pretty nuts. When newly built houses start sinking into the swamp - and since when has Glenville, New York, ever had any swampland? - Johnny goes to investigate. The housing developers are baffled, but a crazy old coot yells at them that it's swamp demons!, angry at being disturbed. 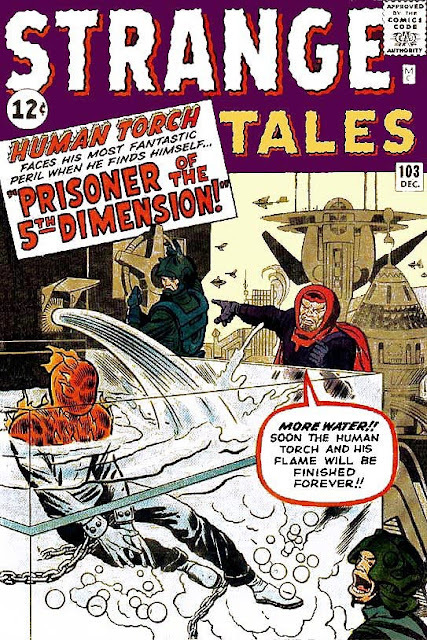 The Torch comes back at night, however, and sees the coot in the presence of two alien creatures, shooting a ray gun at the new house to make it sink. When Johnny confronts them, the coot pulls off his rubber mask, revealing himself to be an alien as well - and kidnaps Johnny to the Fifth Dimension! There, the tyrant Zemu has him imprisoned in a flame-retardant solution ... until he's free by the beautiful alien girl he spied earlier and her father, who enlist Johnny's aid in their merry band of revolutionaries. 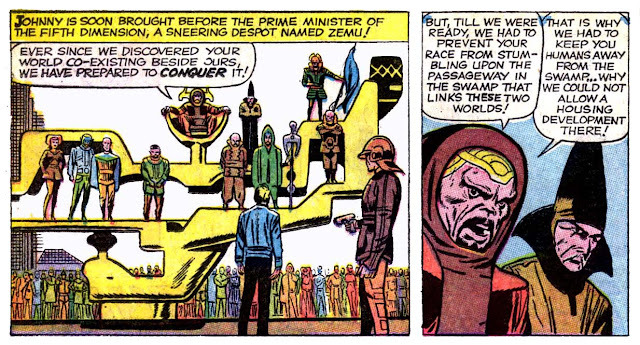 Together, they cause the people of the Fifth Dimension to rise up against Zemu, and the Torch happily heads home! And all this insanity in only 13 pages, folks. This is as good a place to say it as any: Starting this month, with many of the Marvels released in September 1962, detailed credits are now being listed for each story. 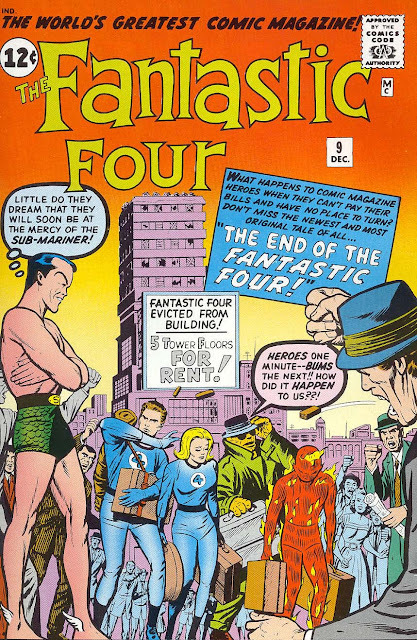 In the Golden Age, and up through the early Silver Age, most comic books did not have listed credits, which is why there are such unanswered mysteries as the identity of the inker on Fantastic Four #2. Many reasons have been posited as to why, ranging from the publishers emphasizing the characters and not the artists (who were paid especially poorly back in the day), to situations such as a late-running strip making its deadline by employing a jam session of various ghost artists, all of them working overnight in one guy's New York apartment on their individual artboards, fueled by nothing more than coffee and cigarettes. One can wonder what prompted Stan to finally make such a change in 1962; I'd hazard it was a mix between wanting to give all hands the recognition he felt they deserved, as well as an attempt to boost sales by turning their writers and artists into identifiable stars. Given that other publishers would eventually catch up to this new practice, it seems to have worked! Zemu the tyrant. Scourge of developers and housing agents everywhere. 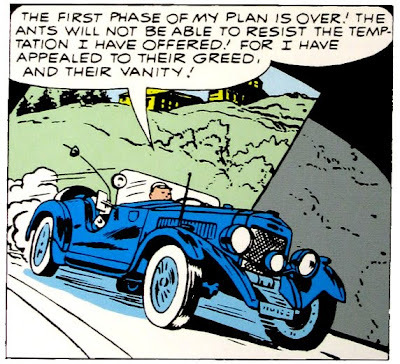 TtA #38 opens by declaring, "Since the appearance of the amazing Ant-Man, the bustling metropolis has offered slim pickings for the underworld!" Which, frankly, sounds a bit incredible. 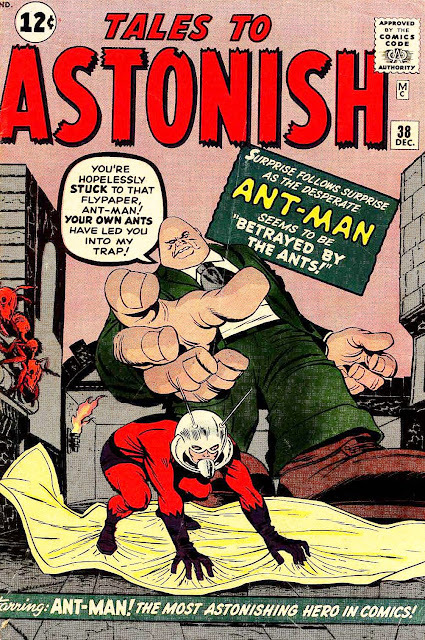 I mentioned earlier how odd it seems that Stan would have picked Hank Pym as a character to bring back as a superhero, and in a monthly feature to boot. When compared to hulking monsters, spider-men, and thunder gods, just how fantastic is a man who can shrink down and talk to ants? We really can take this as yet more evidence that these individual titles were never intended to be set in the same "world" ... although that would start changing, overtly and explicitly, very soon indeed. Perhaps it was an ironic nickname. Like calling a big man "Tiny". 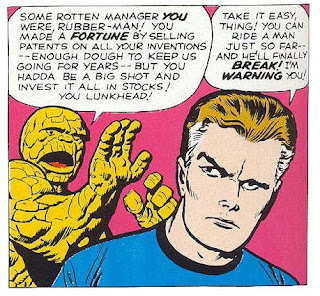 As has been noted, the innovation that Marvel brought to superhero comics in the 1960s was realism. Their characters may have had powers that were incredible, amazing and fantastic - but they also had character flaws and vulnerabilities not seen in the heroes from DC and other publishers. The realism of this fictional world was hammered home in FF #9, as the four faced a foe none of their powers could defeat: bankruptcy! gets ready to throw down on the Thing. Fortunately, in an unbelievable stroke of timing, the FF receive a telegram offering them the chance to star in their very own movie. The team has left their home turf of New York City to visit monster islands and alien planets, but this time they head off to a land even more strange and bizarre - Hollywood! - where the eagle-eyed reader will catch cameo appearances by such figures as Alfred Hitchcock, Dean Martin, Jackie Gleason and more. Of course, they have to get to California first - so they hitchhike, naturally. but also because they're not showing the cover. The FF is in for a shock, however, when they reach the studio and meet the producer - only to find it's Namor, the Sub-Mariner! 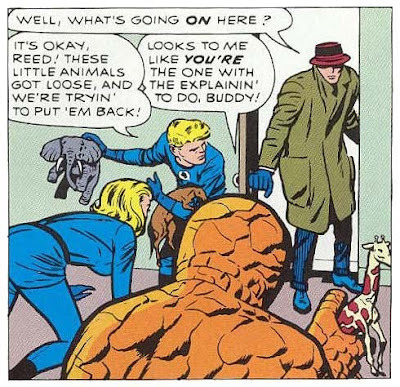 He tells them that his offer is real, and proceeds to then take Reed, Ben and Johnny to exotic locales, one at a time, to film their individual scenes. It should come as no surprise that each location is filled with danger and menace, and he's brought each one of them to their intended demise. Check out that radar sense. Is this where Stan first came up with the concept of Daredevil? 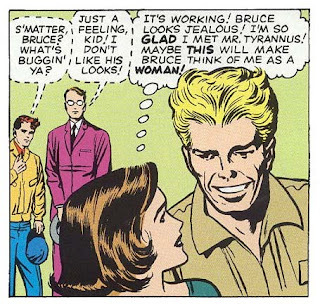 Hilariously, when Namor returns after disposing of the three, he tells the Invisible Girl the truth, as well as his reason: He's in love with Sue, and thought that conquering her three teammates would be the best way to prove his worth and win her heart. As you'd expect, this doesn't go down very well with Sue Storm, who fights back against Namor until her three teammates, having each freed himself, show up to help. What's most telling, though, was Sue's initial response: "Perhaps, if you hadn't deceived us -- if you had been honest with us, I might have answered differently!" 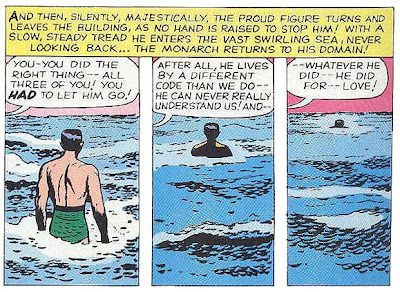 And Namor walks off into the sea ... until next time. After the impressive introduction of Loki and the other Asgardian elements last issue, it's disappointing to see that followed up by a tale pitting Thor against "Zarrko, The Tomorrow Man". Surprisingly, it's a decent read, one with numerous twists and turns that makes economic use of the 13 pages available. In short order: Zarrko, a man from the future, comes to present-day Earth to steal a cobalt bomb, to use against his own time. 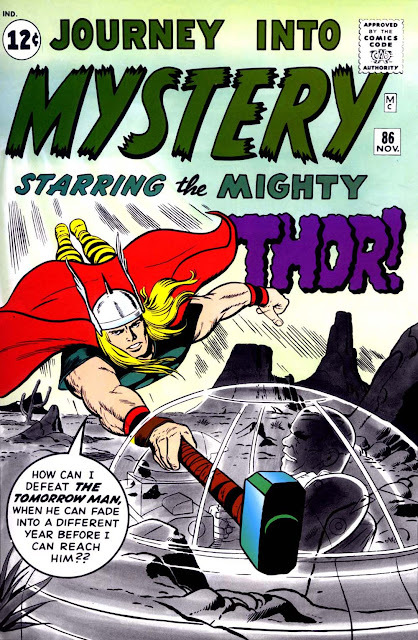 After seeking advice from Odin, Thor follows Zarrko into the future and gives chase, but a black-robed figure dogs his heels - who turns out to be Thor himself, with the Thor we'd been watching just a decoy! 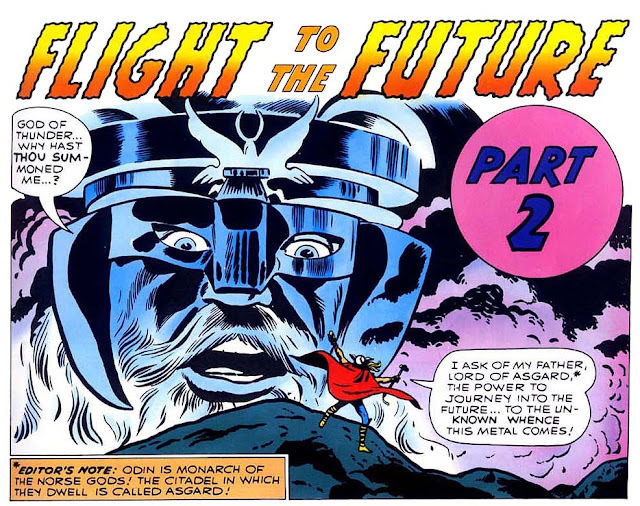 He then has to defeat Zarrko's giant robots, and there's a tight moment when one grabs Thor's hammer; since he will revert to Dr. Blake if he's separated from it for more than a minute, the next half-dozen panels show the seconds ticking away, one by one, in the background - not too bad a narrative device, really. 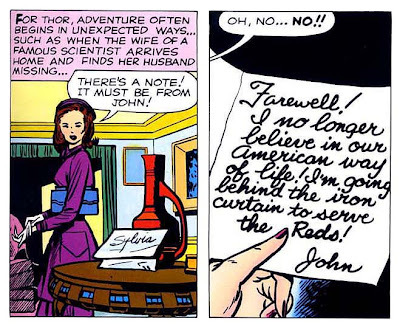 All ends well, with Thor recovering the cobalt bomb, Zarrko defeated, and Nurse Jane Foster, back in the present, wishing she worked for the exciting Thor, and not "colorless Don Blake!" Thor as a tool of the US military - or just a tool? One of the fascinating things about reading these old comics is how they capture a snapshot of the time period, sometimes in style and dress, and sometimes in attitude. For instance, there's the old sentiment of how a country should look on its military with love during war, and suspicion during peace - but in so many of these comics from 1962, there's an overwhelming sense of a country that only looked on its military with unquestioning fealty, even to the point of Thor helping the army with a bomb test, or Rick Jones being so easily taken in by cries of patriotism. 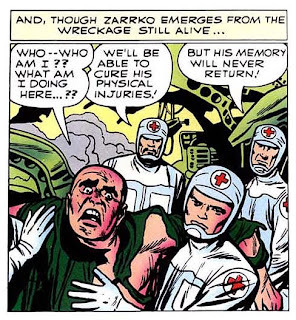 Interestingly, the question is given a different spin when we get to the 23rd century, where humanity has evolved past the desire for war and any sort of military or weapons - and therefore has no defense against Zarrko's aberrant aims. Odin may only have a one-panel appearance ... but they make sure it's a doozy. The Tomorrow Man defeated ... until the day after next. Sadly, the Torch's second solo outing is a bit of a dud. 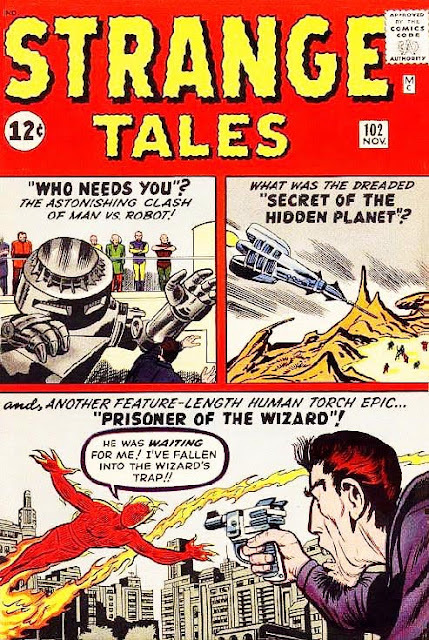 Here we meet the supersmart Wizard, who in a few years would team up with some other villains to become the leader of the Frightful Four. Here, he's seen as a mini-celebrity in his own right, who is a genius chess player, a master escape artist, a brilliant inventor, and more - but one who challenges the Torch because he can't stand the thought that someone else is his superior. As opposed to, say, targeting Mr. Fantastic, who's clearly much more on his level. And yet what most strikes the reader is the guy's bizarrely long face, and incredibly wild chin fuzz. And yet, for all his claims of genius, the Torch's master stroke is so transparent we're agog at how dumb the Wizard is. After challenging Johnny one final time, he's thunderstruck when the Torch demonstrates the ability to raise some photographs into the air without touching them ... and so the Wizard admits defeat and gives himself up. Even before the reveal, we've figured out that Johnny called in the help of his sister, the Invisible Girl. But that's the catch, isn't it? 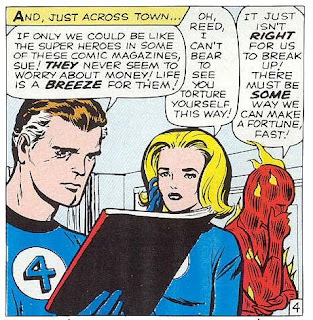 The story counts on the reader knowing who Sue Storm is, so we'll be in on the joke when the twist is revealed ... and yet also asks us to believe that someone who might be one of the most brilliant minds on the planet doesn't know that The Human Torch is part of the Fantastic Four, and is brother to the Invisible Girl. Can't have it both ways, you know. The Wizard looks just as disappointed in this story as we are.